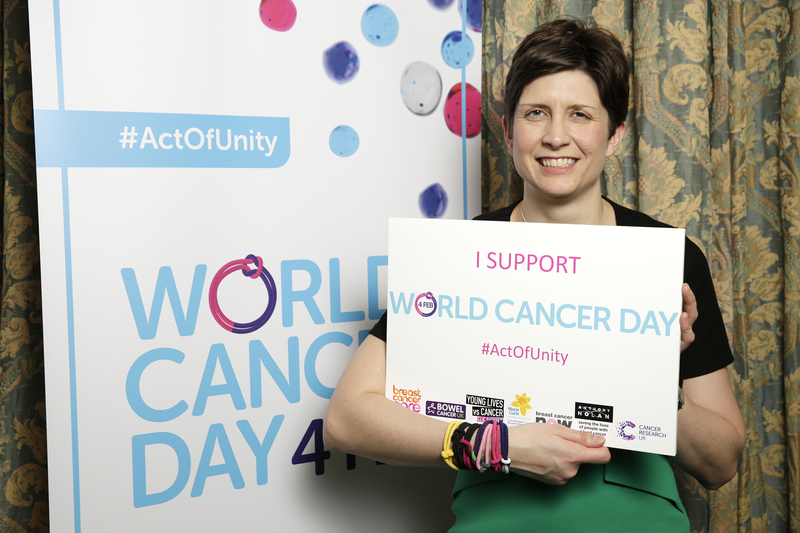 Alison Thewliss, SNP MP for Glasgow Central, attended an event in Parliament yesterday (Wednesday 1 February) to show her support for World Cancer Day on Saturday 4 February 2017. Ms Thewliss met with representatives from seven of the UK’s leading charities, who have joined forces to help people affected by cancer. Cancer Research UK, Breast Cancer Care, Breast Cancer Now, CLIC Sargent, Anthony Nolan, Bowel Cancer UK and Marie Curie are calling on people across Glasgow to show their support by wearing a Unity Band or donating. By joining forces, the charities will make a bigger impact in transforming the lives of millions who are affected by cancer. One in two people born in the UK will develop cancer at some point in their lifetime. The Unity Bands are made of two parts, knotted together, to symbolise strength in unity and the power of what can be achieved when people join forces. The bands are available from each charity on their websites, shops and other retail outlets for a suggested donation of £2. All money raised from the Unity Bands will go towards the charities’ individual work. “I’m calling on people in Glasgow to join me by wearing a Unity Band, making a donation or spreading the word on social media in support of World Cancer Day, which is taking place on Saturday 4 February.